There has been a prevailing piece of propaganda used by the dollar-haters to support this idea that the dollar is really the Petrodollar and that the move in the Middle East to create a single currency like the Euro and the Russia-China energy deal will make the yuan soar and the dollar collapse are just not reality. These “theories” (if not prayers) focus everything upon fuel as if this were the lion-share of world trade and the ONLY reason the dollar survives. This maybe suitable for a James Bond movie plot, but the numbers just do not support it. Even if we look at the fuel trade compared to manufactures goods, fuels are just 29% of that number – $3,374,854,000,000 for fuels and $11,489,647,000,000 for manufactured goods. (see trade by sector). Nonetheless, total world trade that includes services such as money flows (investment banking) is rising since 2007 as a percent of total World GDP because the global economy is shrinking. This is causing world capital flows for trade in energy, merchandise, and investment to rise in proportion of importance as domestic GDP declines in the ensuing world economy recession that began in 2007.15. 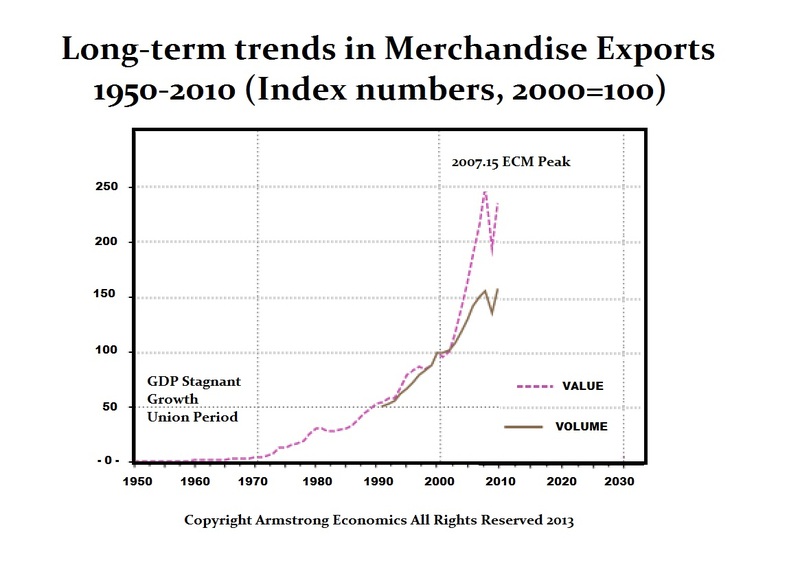 This sets the stage for the next age of protectionism. Our preliminary figures show total flows of capital for these three categories is about 60% of World GDP. Consequently, this theory of the Petrodollar is just another exaggeration of those who pray for the demise of the dollar every night without contemplating what that really means. The strength of the dollar is NOT trade. The dollar is the only currency not to default or be cancelled regularly to prevent people from hiding cash – a favorite European trick. These 1861 Demand Notes, the first paper currency issued by the Federal government post-American Revolution, are still legal tender and you can spend them if you are crazy enough to do that. It is the capacity of the dollar to provide the parking spot for world capital that is its strength. It does not matter if the Middle East creates a single currency, they lack the capacity to absorb those funds and still will need to invest and park in dollars. The same is true for the Russia-China trade deal. Even if all of Asia used the yuan for trade, they still have to park their funds in dollars. China lacks a mature investment capital base at this time. Those who pray at the foot of their bed every night for the demise of the dollar have no understanding of what they are praying for. The destruction of the dollar with no viable replacement at this time would be so catastrophic for all pensions would be void, civil unrest and civil war will ensure that blood flows down the streets, and not even gold would have any value for then you move to the final stage – a Dark Age where only food has value.